contribute to this ever-growing body of knowledge for many years to come. Notes: Another remarkable week! While we are always open to being proven wrong, this week's new record of 480 birds banded will likely stand for a while. Contributing to this total was another new daily record of 118 on Wednesday, followed up by 101 more on Thursday. Arguably the most hectic day though was Tuesday, when we banded 66 birds in half a morning, due to the arrival of high winds and rain around 9:30. 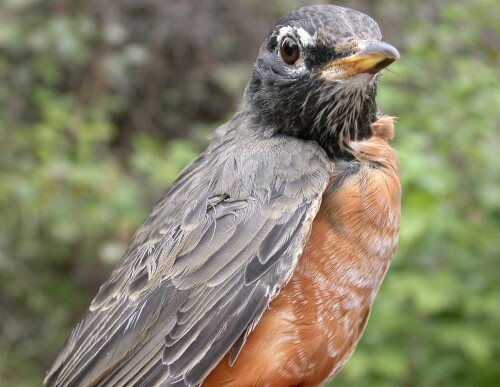 Overall, both the number of species banded and observed were only marginally lower than last week. However, the cold front which came through on Friday produced a distinct change in the bird community, shifting the focus from warblers to sparrows, and it is likely we have seen the last of many of the less cold-hardy species until next spring. 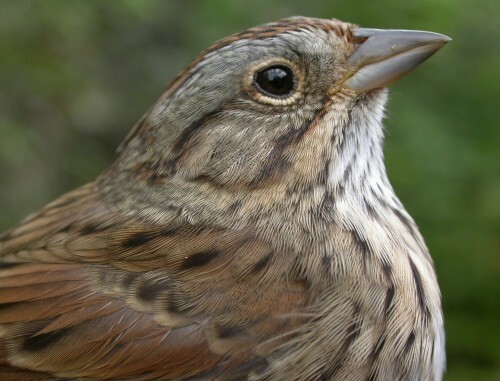 Topping the list of species banded for a second consecutive week was White-throated Sparrow with 86, for an impressive two-week total of 130. Close behind this week was Yellow-rumped (Myrtle) Warbler with 76. Rounding out this week's top five were Ruby-crowned Kinglet (46), Red-eyed Vireo (33), and Song Sparrow (27). As usual, we also banded several less common species. New for the season this week were Purple Finch, White-crowned Sparrow, and Yellow-shafted Flicker - the last bird of the week, and only our second ever banded at MBO even though they are seen in the area regularly. Others of particular interest included 2 Winter Wrens, 1 Warbling Vireo, a late Yellow Warbler, and relatively good numbers of Grey-cheeked Thrush (6) and Lincoln's Sparrow (7). Also of note, we banded a single Blue Jay every day this week. In addition to the aforementioned White-crowned Sparrow, species seen for the first time this fall were Eastern Bluebird, Hermit Thrush. We still had 19 warbler species, though since Friday we have had only 7. Rusty Blackbirds, Canada Geese, and both species of kinglet have become much more plentiful this week.